This saree is her mom’s and gifted by her soulmate, her brother. Dear Friends, this is a story that can be actually crafted like a script and presented in a wonderful romantic tale by one of those sensitive directors. Mousumi was a simple but an elegant lady. She had a rich sense of taste & culture which she imbibed from her childhood. 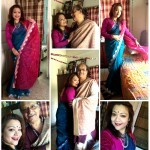 Mousumi had a natural knack towards style and fashion, but in a very simple and candid way! She had a passion for sarees and would buy sarees from her little savings. This specific piece was a gift by her son, during his first visit to Mysore….A precious possession kept under intense care. But fortune played a foul game. For quite some time she was not in a state to even think about saree, her health was taking a U-turn, and she limited herself to a bed compromising with life. At this juncture one major upset occurred. Her son, staying away from home-town suddenly faced demise. Mousumi could not move, could not howl with helplessness like other normal mothers! Few priceless tear drops, merely 3-months wait, she happily joined her son, to the other world. I was an invisible part of this family; I had a wonderful comrade, a younger sister (I call her TottoKumari), an aged uncle, and above all Mousumi (my Kakima) an inspiring woman, a charismatic character of that unit. TottoKumari felt, after this double loss of her life, Mousumi’s sarees should be given to people who needs them or who are worth of getting them. I am a Lucky soul. 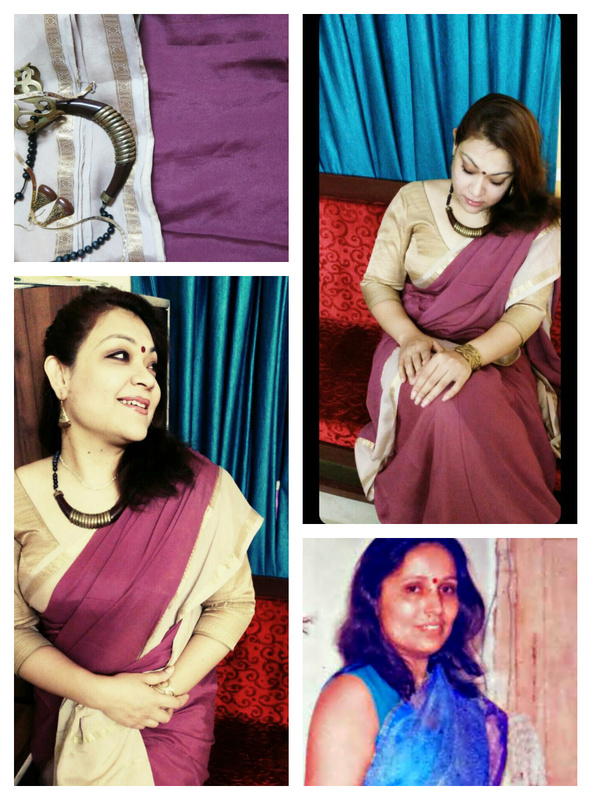 Yes I somehow have earned that place in her heart where I can drape such a sentimental saree and present it in my sareepact platform. It was an absolutely strange feeling that stroked with each layer of this drape; 84/100 #100sareepact was very difficult to pen down. The person who has gifted and the person who has accepted both are not here any more; I just cannot- see this mother-son duo, but when I wrapped this saree the warmth I felt is truly ‘Out of the World’! It had peace, comfort, love, affection, happiness, craving.. a mixed feelings of all…. I pray to God, hope MY SHORE (read Mysore) silk story reaches to HER SHORE and flow forever…. Kakima, this is for you! ‘Mishti- Hriday’, my comrade hope you can see too!! Last not but least, ‘TottoKumari’ a big HUG, Thanks for considering me, so important.